The societal obligations of corporations has increasingly broadened since the start of this century. Once grounded almost exclusively in a toleration (memorialized in and constrained by law) of philanthropy, these societal obligations have become deeply embedded in larger political battles over the administration of globalized economic activity, and the destabilizing effects of trends toward the governmentalization of what might once have been understood as the private sector, along with the privatization of what was once the public sector. As these trends have matured, law (and the state) has also returned to and now is embedded in initiatives to manage these social (and perhaps now increasingly legal) obligations of enterprises with respect to their economic activities. These trends are apparent both in the drive toward the legalization of the human rights related obligations of enterprises (see, e.g., here), and in the increasing importance of sustainability as part of the core objectives of enterprise operation (see, e.g., U.N. Sustainability Goals). This convergence of public and private space in the context of sustainability obligations is much in evidence in China. Our friends art the Conference Board have recently released a report that considers these trends (Anke Schrader, China and the UN Sustainable Development Goals: Policy Priorities and Business Strategies (Conference Board July 2018). The Press Release describes the report as follows:. Many of China’s most pressing domestic policy priorities—chiefly, poverty alleviation and pollution control—are closely aligned with the 17 goals set in the UN’s 2030 Agenda, and China has a vested interest in achieving permanent, continuous improvements in these areas. Companies, through their commercial and sustainability activities, have a crucial role to play in realizing these goals, but most don’t know how to leverage the opportunities. This report examines the approaches Chinese policy makers are adopting to implement the SDGs, describes the targeted focal areas for each goal, and identifies the government resources that companies can use to assess the relevance of focal areas and their respective aspects for their business. The Report is worth reading. 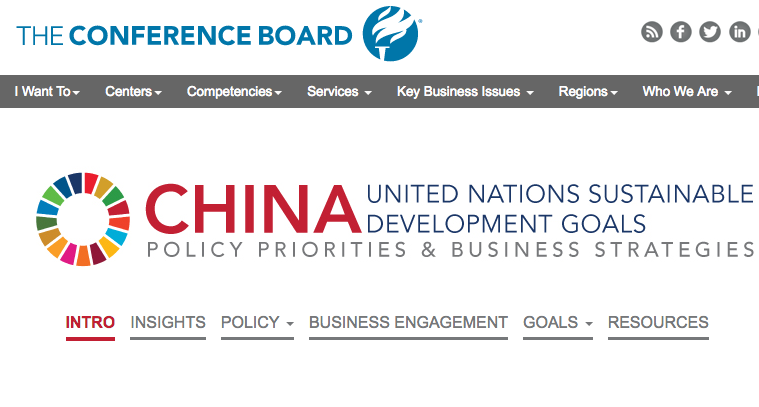 What follows are its sections on "Business Engagement Opportunities" and Resources (with links) on Sustainable Development Goals and China provided by the author in the Report. From a business perspective, the UN's Sustainable Development Goals (SDGs) are a call to action for the corporate sector to help address crucial global challenges. Their agreed definitions, measures, and common-language framework can help companies more consistently and effectively structure, measure, report, and communicate with stakeholders about their impact and performance in a way that is recognized globally. How to Report on the SDGs: What Good Looks Like and Why It Matters (KPMG, 2018)..
For most businesses in China, including foreign firms, directly addressing the SDGs is essentially uncharted territory. Many companies are still in the early stages of their sustainability journey in China, and existing programs often lack strategic intent or deep commitment. The obvious and numerous synergies between China's own national policy priorities and the SDGs may change this status quo. Simply put, there is a tremendous opportunity for foreign firms to utilize areas of SDG alignment to bootstrap and significantly elevate their sustainability programs in China by exploiting the globality of the SDGs and China's related national interests. Foreign firms, in particular, should be in an opportune position to leverage in China the sustainability expertise they have matured elsewhere. Exploiting this opportunity requires that companies fully recognize the important, perhaps soon-to-be essential, role of sustainability as a business value driver in China In fact, governmental sensitivities regarding civil society developments are high in China, so the less NGO-like sustainability programs are conceived, the better. Government stakeholders are often distrustful of foreign firms’ motives behind purely charitable gifts. Instead, government interlocutors want to clearly understand companies’ motives behind sustainability activities, and commercial aspects (such as brand and business development) are motives they understand—much better, in fact, than simply “doing good.” (Summarized based on member discussions at a recent China Center Deep Dive Exchange member event. See here for the meeting write-up). . It's not about charity. It's not about currying favor with the government. In today's China, it's about innovative programs that leverage a company's recognized technology assets and/or core competencies to yield demonstrable benefits in both upgrading Chinese commercial ecosystems and improving social welfare. Programs of this nature require a deep understanding of the Chinese government's development objectives and priorities, then selecting and scoping projects that maximize alignment. The focal areas the government has outlined for the implementation of the SDGs in China, if used and prioritized correctly, provide an ideal framework for businesses to identify areas where sustainability, commercial, and political priorities overlap. By mapping company resources and competencies, commercial interests, and sustainability priorities against those focal areas, companies can identify high-impact areas for engagement. This can, if fully utilized, offer companies an opportunity to move away from corporate social responsibility (CSR) and short-termism to a real transformation of current business models and socioeconomic investing in China. Exceeding that, there is potentially a significant opportunity for groups of foreign companies to work together, effectively linking ecosystems of core values and competencies around particular focal areas to achieve breakthrough levels of impact related to specific China SDG priorities. The Blockchain Food Safety AllianceIn December 2017, Walmart, JDcom, IBM, and Tsinghua University co-launched the Blockchain Food Safety Alliance, aiming to build a blockchain technology platform to increase food supply chain transparency and ensure food safety in China. appears to be a promising example of the power of such collaboration (Walmart, IBM, JD.com, and others). It is highly visible, plays to the core strengths and interests of the companies participating in the alliance, and addresses one of China's leadership's most perennial PR nightmares—food safety. It also aligns with SDG Goal 2 (“End hunger, achieve food security and improved nutrition and promote sustainable agriculture”), and one of China's key focal areas for this goal is to ensure food safety. “Localizing” the SDGs can also serve as a powerful communication tool inside and outside China. 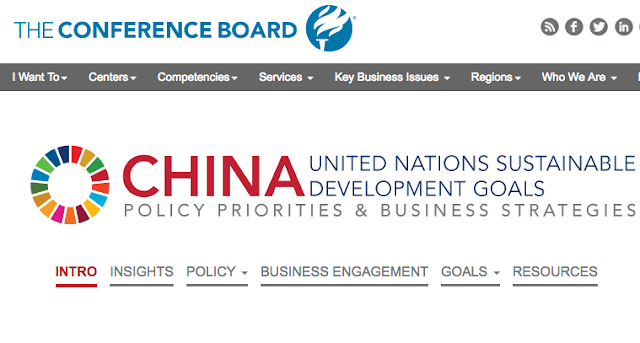 Because most Chinese citizens may not yet be familiar with the SDGs or, if so, may consider them a “foreign” concept, obvious alignment of the goals with China-specific focal areas can help place the SDGs in a context that local staff, government counterparts, and other domestic stakeholders can more readily understand and relate to. By using a consistent reference framework and language for sustainability programs, global sustainability teams can better understand and support local engagement efforts. The official UN SDG website provides a detailed overview of the 17 SDGs and their 169 targets. The platform provides a wide variety of information related to the SDGs. The report provides an annual assessment of global and regional progress towards the implementation of the SDGs. The database provides access to detailed data compiled through the UN System in preparation for the Secretary-General's annual report on "Progress towards the Sustainable Development Goals". The report examines the interactions between the various goals and targets, determining to what extent they reinforce or conflict with each other. It provides a blueprint to help countries implement and achieve the SDGs. This online resource showcases the latest in science, law, business, events and more that can help drive forward the SDGs. The SDG Compass report provides guidance for companies on how they can align their strategies as well as measure and manage their contribution to the realization of the SDGs. The inventory maps existing business tools against the SDGs. The inventory maps existing business indicators against the SDGs. The platform explains the role of business in achieving the SDGs, and showcases illustrative examples of business solutions, indicators and tools for each goal. This guide sets out clear actions that CEOs can take to begin to align their organizations with the SDGs and plot a course towards unlocking the value they represent. The report showcases industry-specific examples and ideas for corporate action related to the SDGs. The report illustrates how core leadership qualities can be applied to a business' strategy, business model, products, supply chain, partnerships, and operations to take leading action in support of the SDGs. The report sets out five steps for companies to take to contribute to the SDGs through embedding them in the value-creation process. The initiative develops a harmonized set of disclosures (including qualitative and quantitative indicators) for companies to report on the SDGs. The report introduces a set of core reporting indicators and provides the criteria for answering what constitutes a sustainability report in the context of the SDG monitoring framework. The report proposes quality criteria for SDG reporting which business can use as guide for its own reporting, and helps business to benchmark its own reporting against the global leadership group. The plan describes China’s envisioned engagement on the SDGs and identifies areas it intends to focus on. The report assesses China’s progress towards achieving the SDGs. This online course showcases UNDP experts who introduce each goal, focusing on the global SDG agenda, and Chinese experts who provide an overview of the current situation and challenges in China. It provides recommendations for actions for all stakeholders. A great resource to help employees better understand the global objectives of the SDGs and how they relate to China.